Is the up to 88 lbs the largest one available? I have 2 Great Danes who both weigh 180-190 lbs each. Would this still work for them? Unfortunately this is as large as it gets. You might have to use double for each of them. I have used different product in past the vet suggested buying large breed flea meds and dose a certain amount for each of my small dogs that way I get a better deal for my money being that I have 5 small dogs.is it safe to use 1 tube on say about 4 dogs? Since there might be risks involved we advise using products as instructed on the box. I run a nonprofit cat rescue and Revolution is the ONLY thing that works! 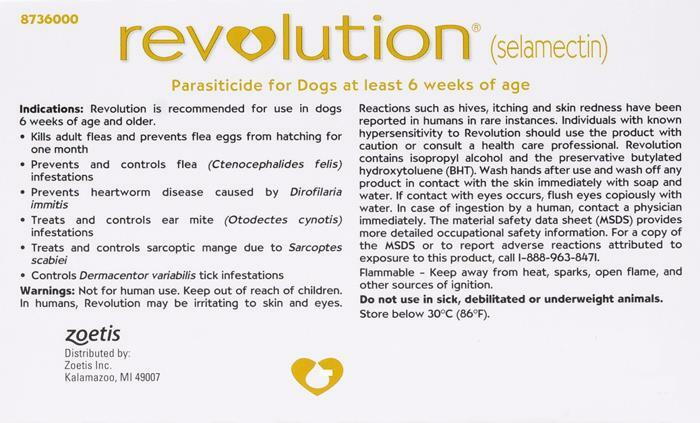 We've tried them all and nothing else works, especially those containing fipronil (Frontline). Revolution is great stuff and actually works!